Why are they suddenly bidding in prime numbers? yes bill, i’ll tag this later. p.s. This is going to be my sloppiest speed-writing ever. Be warned. Minneapolis airport. I felt that it was ennobled, enveloped in a golden halo of being in the city that is forever the home of Layne Johnson, Plain Layne, and the incomparable Odin. Somewhere in this town there’s the Applebees where she had her date with that unsuitable guy! I eat a sandwich, edit that latin article some more, and play “spot the person going to wiscon”. There are 2 possible candidates. One sits next to me on the plane – something nerdly about her – I try to make eye contact a couple of times but she looks out the window steadily, occasionally sniffling and possibly crying. I make up a whole thing where she is going to Wiscon and is cryingn because pat york just died and they were great friends. In my imagination we figure out our vague connection and share a cab. This doesn’t happen. I still wonder if she is here. on reg packet written “badger is a hot babe. i’m in room 437″ well! i guess we didn’t need that panel on how to flirt and get laid – after all. that’s the kind of registration packet that should be at every conference! settled in identity/consciousness what makes a mind, rebuilding a mind panel. amy thomson, john m. scolsi, andrea d. hairston, beth A. Plutchak. andrea hairston talked abotu her novel Mindscape – it sounds quite interesting w. double consciousness (whether feminist or race other consciousness raising, andrea mentioned henry louis gates… also thoughts very much along the lines of how i think about continuity of identity. She’s so loud and bouncy and excited ! I’ll read her book. constructing biological constructed intelligences. genetic engineering, dna, evolving…. a.t. – buddhism and not needing a substrate for consciousness…. panel and audience becomes very boringly about people’s “I know someone who has alzheimers or is autistic” anecdotes. sorry y’all… damn boring. empathy – if you lack it you lack consciousness? humph. and …. i’m running into the entire bay area here in wisconsin… donya… ellen k…. sudden semaphoric excellent conversation about feminist history and the Pointed Firs with oursin, in the Green Room. we made a pact to meet to go to dinner and escape the overstimulation – very smart of her. Debbie N. moderating panel on women and the draft. hmm, just as at the potlatch panel i saw her do, it is moderated with pleasant balance and skill. jeanne g. in countries where they have a draft does it mean that more people, more citizens, everyone, is involved in the decision to go to war or not – i.e. more people care because more people are affected. david h. – draft law going into effect this summer. men and women must register for the draft. nonie – speaks a little bit to what jeanne g. said – universal service might make people more connected to the military so they care more. is it in some way unfeminist to support war. empowerment, or brainwashing? rioting? makes criminality of underclass more prone to violence? makes revolution? destabilizes society? isn’t the hierarchical setup of the military inherently patriarchal… obey w/out question… making of yourself a tool for someone else to wield and spend. could there be a feminist military training? what would a feminist military look like? wwii – guy in yellow yelling about how every woman was in uniform unless had kids or a job? everyone talking… some yelling. nancyjane moore talking about boys and girls.. differencesnow… in sf we can change that and say what if it were different. alan b. even tho the women in military are self-selected but we don’t “expect” them to be able to do the same things as the men. but these women don’t know… the men don’t know what they are capable of. david h. says that black guys in military helped civil rights in this country. eliz. bear – make military more attractive to people – health care, adequate pay, etc. dinner with oursin! she’s splendid! Suddenly London sounds like a nice place to go! auction. ellen klages in a darth vader mask…. space babe! saving the galaxy from outmoded gender roles in speculative fiction! monster women lunch box… well, it quickly went over $100! a bottle of lydia pinkham’s vegetable fcompound. yes, really! 120 bucks. a copy of how to suppress women’s writing. ooooooo…. russ might! just might! come to wiscon next year! And the small posters – Whump got them. “I don’t need to bid against him! I can visit him and see it for free!” “You are not getting the point of a charity auction…” Secretly I resolve to try to bully Whump into giving me the postcard triptych of Amazing Stories Spacebabe covers! After all – it’s almost my birthday. Perhaps I could push him into the hotel pool. Give us the precious! It’s our birthday presssssent! Oh – whoops, it got wet. Darn. I wish that these posters would get printed for all of us… wouldn’t a hundred people paying 10 bucks be better than one original, auctioned? One could still auction the original. The audience seemed so sad. vague flitting about. exhausted. why am i not in bed? Some people are very dressed up for the Tor party. Hot tubbing. 4 or 5 of us had funny-colored hair so that I felt like gonzo with the funkified alien gonzos from the big spaceship in Muppets in Space. Home! My people! the Con Suite has fortune cookies. mine says “A long life has its effect. If you live long enough you will see a wrinkle… in time.” Did they get these specially made? I’m impressed! introducing people is very easy. Cool feminist nerd, meet another cool feminist nerd. See how simple that was? Do you mind if I index your WisCon posts on Whileaway? A link to it is fine. Hey, where are you? Are you here? Alas, no. No WisCon for me. I’m just home and trying to collect other people’s reports of the con. Oh it does sound great! I’m not even a big SF person, but it just sounds like a blast. btw– the “failing boys in school more than girls”– statistically girls are doing better in school the last 5-10 years, getting higher grades overall, going to college more, getting more college degrees. But yeah, schools are probably failing girls in different ways. not so much academically, though. Elswhere, there is no trip like the trip which is WisCon. Any good SF con, for an SF reader, is about as much fun as you can have without getting arrested. WisCon is as much fun as you can have without getting arrested EVEN IN MADISON! 700-800 fun and funky feminists of all genders sexual identities, etc., intelligent and well-read, aged 3 weeks to 80+ years, spending an intensive four days immersed in each others’ mindspaces! I praise God every year that I live so close to this wonder (and I’ve been to SF cons from Den Haag to L.A.). 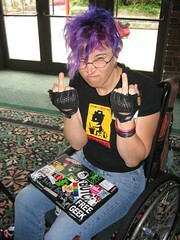 And if you don’t think you’re a big SF person, WisCon is likely to introduce you to SF that makes you think otherwise!